My gardening efforts this summer have been some of the worst in recent memory, but I’m at least trying to keep the veggies and flowers in the pots alive. The other day as I was watering, a quick movement near the bottom of the tomato pot caught my eye. 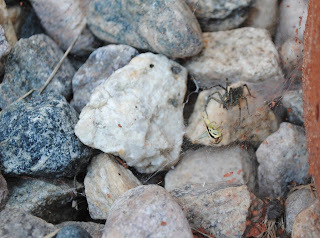 I leaned down for a closer look—as writers, we should always get a closer look—and saw a spider darting away. A moment later, she emerged, and I immediately identified what had drawn her back out. A baby grasshopper, pistachio-green and cute as a Disney character, was caught in her web. He struggled, his tiny kicking legs snared by strands of silk, as the spider again approached, attacked, retreated. I called my sons over to witness this little bit of nature drama being played out in our back yard. It held their interest for a few moments, and then they returned to tossing the football with their dad. And still, I watched. Approach, attack, retreat. The grasshopper fought on, even as his efforts tangled him more tightly in her web. After a while, I began to wonder why I was still watching. I had other things on my list that were more important and/or served in a chilled glass, so why didn’t I attend to them? I realized that these tiny creatures were demonstrating the essence of good storytelling: keep the audience wanting to know what happens next. I want a book--whether it’s a sweeping epic weaving together intricate storylines or a stark tale of villain and victim--to catch me in its web and hold me there for the duration. As a writer, I’m realizing that this means cutting out the window-dressing—the scenes that go nowhere, the unnecessary dialogue, the superfluous descriptions. Simple concept, right? But simple, alas, is rarely as easy as it sounds. What helps you get to the essence of your storytelling? What helps me get to the essence of my storytelling is reading blog posts like this! I struggle to "cut to the chase" and I tend to get off on tangents that don't tie into the main struggle. So reading this post is just the reminder I need, just when I need it. I was spellbound by the spider drama, so I think you managed to keep to the essence in this "story" -- thanks for the post.